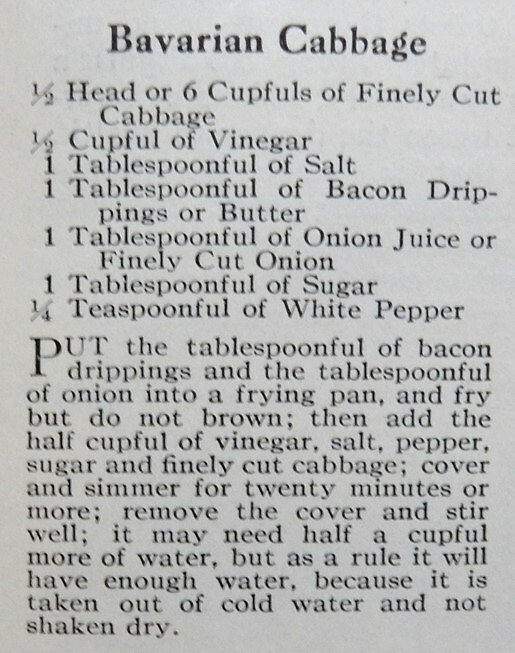 I found a delightful Bavarian Cabbage recipe in a hundred-year-old magazine. This traditional German dish was refreshingly sweet-sour (more sour than sweet), and would be lovely served with sausages, roast beef, or pork. It tasted very authentic; and if I closed my eyes and listened hard enough, I could almost see myself sitting at an outdoor cafe on the banks of the Rhine on a cool October day while listening to merry Octoberfest music. I used less salt than the original recipe called for. One tablespoon of salt seemed like a lot – so I decided that it probably was a typo and instead used 1 teaspoon of salt. I also didn’t quite understand the last part of the old recipe about cold water (though I’m guessing that it was directing the cook to wash the cabbage prior to cooking). Posted on October 16, 2016 October 17, 2016 by SherylPosted in FoodTagged cabbage, recipe. A classic and timeless recipe! I’m curious, where do you get your 100-year old magazines? I get the magazines at the library. I am very fortunate to live near a very good library that has lots of hundred-year-old magazines. That makes sense. I bet you’re right that they soaked the cabbage in water. This recipe was from the February issue of the magazine. Back then a cabbage in February would have been stored for several months, and may have been getting dried out and limp. I am trying this one next weekend. It looks divine! I love cabbage and put it in all my winter stews and soups. Thanks for sharing! You’re welcome. I think that you’ll like this recipe. Looks good. What did you eat with the cabbage? Potatoes? I had it with sausages, and some crusty bread. I wondered about sausage. I bet that’s delicious in this recipe. Vintage recipes are wonderful. I’ve been trying a few relish recipes from the 1800s. The ingredients are simple and they taste great. It is a lovely dish. I agree! Simple is often the tastiest, and I really like how many old recipes only had a few ingredients. I think you’re right. The cabbage was probably cut and then was covered with water so all the dirt sinks down, then placed in the pot with some of the water still on. I use this method when steaming Swiss chard. Sheryl love reading these old recipes. Thanks for all these great shares. It’s nice to hear that you enjoy these old recipes. I have a lot fun doing this blog. I would definitely eat this with sausages. It goes well with sausage. Not sure I’ve ever seen “delightful” and “cabbage” in the same sentence before! 😉 This does sound really good, though! Sounds so good. 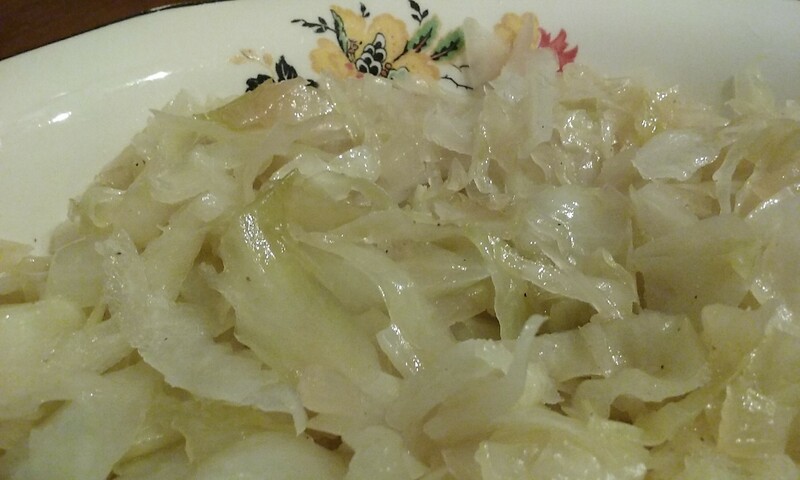 I’m a big fan of cabbage and enjoyed eating it frequently when we were in Germany last year. I think that you’d like this dish. In my opinion this dish has a very authentic German taste. I made this using the butter instead of bacon, and added the onions and sausage. It was delicious! There are always vintage, classic cabbage recipes. This is one! This is very interesting and sounds like such a gem to come across! I would love to try it out, so lovely of you to share! It’s wonderful. I think that you’d enjoy this recipe. An old recipe but a delicious one!